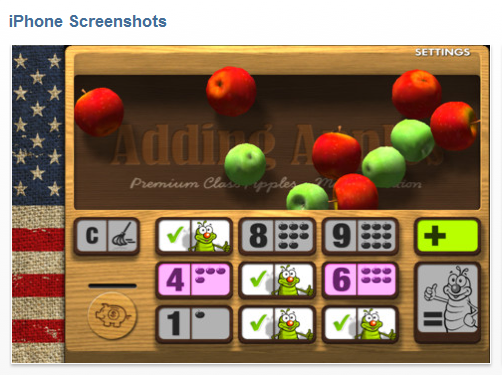 Adding Apples is solely an addition operations app currently gone free today. Compatible with iPad, iPhone/iPod Touch. Provides ability for rational counting with items displayed and a choice of answers for students to choose from. Unlike many other apps you are able to enter students names to collect basic accuracy data. Settings allows turning some features on and off including highest adden (up to 9) lock a set of addens to practice, turning music on and off and automatic plus and clear feature. Appropriate app for elementary school students practicing addition facts but require visuals rather than mental math. Kid friendly interface. Has been rated well in 2011. Free today. Share with your special ed teachers to add to their iTool Kit! This entry was posted in App Reviews, Apps for Special Needs, iPad, iPhone, iPod, Math, Special education, Uncategorized and tagged App Review, iPad, iPod, math, OT Apps, special education. Bookmark the permalink.